There are many great uses for the iPad, and for activities like reading books, magazines, and newspapers, and playing console-quality games it is exceptional. It's in its ability to stream video, however, that the iPad truly shines. But before you can take full advantage of the iPad's streaming capabilities, you need to download the best apps for streaming movies and television shows you'll enjoy. Crackle may be the best app that most people are unaware of. It may not exactly be Netflix in terms of the sheer number of movies and TV shows you can stream, but it does have one major advantage over the most recognizable streaming service: it's free. Crackle uses an ad-supported model, which means you will see an advertisement before the show begins and a few during the movie or TV show, but not nearly as many as you would see if you were watching broadcast television. Crackle has a good lineup of films, and even a few originals you can only see on Crackle. It is a free download without a subscription. By now, most everyone has heard of Netflix. What started out as a movie-rental-by-mail service has grown into a titan dominating the streaming video business. Beyond movies, however, what you might not realize is just how much great original programming Netflix is producing these days. Original programming has become a central selling point in the streaming business. HBO, Starz, and the other premium networks began moving to it when Netflix started taking over the streaming industry, and now that they are on top, Netflix has jumped on the original content bandwagon with a vengeance. This includes top hits like ​"Stranger Things" and "The O.C." alongside Marvel Cinematic Universe (MCU) content like "Daredevil" and "Jessica Jones." There are a few subscription options to pick from for Netflix, including one that streams 4K quality content. Amazon Prime has come a long way since being simply a free two-day shipping service offered by the world's largest online store. Now, your Amazon Prime subscriptions gives you access to Amazon Prime Video, which includes a collection of movies and streaming television that is second only to Netflix. Similar to Netflix, Amazon produces its own original content. They don't produce as much original content as Netflix, but the quality of shows like "Man in the High Castle" rivals the best of Netflix. As an added benefit, you can subscribe to premium cable channels like HBO and Starz through your Amazon Prime subscription, which is great for those who have cut the cord. Amazon Prime subscription can be a better deal than some other streaming services, especially when paid yearly. And, of course, you also get the free two-day shipping, plus a host of other services. Hulu pairs very well with Netflix, Amazon Prime Video, or both. While Netflix and Amazon concentrate on streaming rights to movies and television at roughly the same time they might come out on DVD and Blu-ray, Hulu focuses primarily on bringing you some of the most popular current television shows. Though Hulu doesn't cover everything on television, it does include a wide range of shows from different networks. Plus, you can usually stream new episodes of shows the day after they are broadcast, though some networks may delay a show's appearance on Hulu up to a week or more. Hulu is almost like having a DVR for cable television without having a subscription to cable television, which is why it is popular with both cord cutters and non-cord cutters alike. The first tier of Hulu subscriptions is an ad-supported model—meaning you will get served commercials at the beginning and throughout the shows. There is a higher tier service that eliminates ads, giving you an uninterrupted viewing experience you can't get on broadcast TV. Hulu also has a live television package that starts at $40 a month and can replace your cable subscription. When talking about video served via the web, you can't leave out YouTube. But you don't need to boot up a web browser to enjoy your favorite YouTube channels. If you frequently stream videos from YouTube, you should download the YouTube app, which has a slick interface and gives you access to everything you can see on the website. Love music? Hate advertisements? Watch a LOT of YouTube? YouTube Red is a subscription service that will eliminate the advertisements and provide free music streaming alongside ad-free YouTube videos and original content not available to the rest of YouTube. You don't have to use an app get excellent streaming video service on the iPad, and FunnyOrDie.com proves this. The same great comedy found on the website can easily be viewed with the iPad, and because the website supports iPad video, it supports the video out capabilities of the iPad through AirPlay. FunnyOrDie.com also offers HD version of their videos, so if you do stream them to your TV, they'll look fantastic. There is something for everyone in TED, which hosts speeches and presentations from the world's most fascinating people. From Stephen Hawking to Steve Jobs to Tony Robbins to teenaged boy wonders playing bluegrass, TED is a great educational app that explores a broad range of topics in depth and helps simplify complex issues. Google Play may seem like an odd choice for a roundup of movie streaming apps for the iPad, but for those who have moved over from Android and who have already built up a Google Play library, this is a must-have app. In fact, many iPad and iPhone users have moved from iTunes to make big content services like Amazon or Google their streaming source of choice. Even if you've never owned an Android device, building a library in Google Play is a viable option as you move to stream content. In addition to premium services like Netflix and Hulu, and free movies from Crackle and free video from places like YouTube and TED, you can also download broadcast and cable network apps, including ABC, CBS, and NBC as well as SyFy and ESPN. These apps work best with a cable subscription, which grant you access to stream the most recent episodes and (for some) even watch live television through the app. Signing in using your cable provider account allows you to essentially use your cable subscription as a pass for supported apps. With broadcast and cable TV, the iPad's TV app is a great help. It can aggregate content from these apps, as well as from subscription streaming services like Hulu and Netflix, putting all of your content together in one place so you can find what you want to watch next without having to open each individual streaming app as you hunt for movies and TV shows. 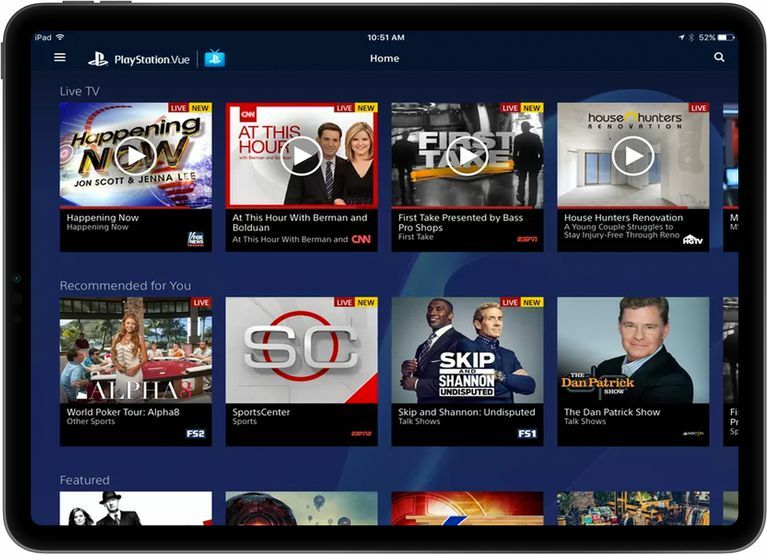 Browse the full list of cable networks and broadcast TV networks available on the iPad. The newest trend in cord-cutting doesn't cut out the benefits of cable television. If your biggest problem is with the cable companies themselves or with the two-year contracts they try to tie customers down with, cable-over-Internet may be a good solution for you to check out. These services are just what they sound like: cable television that is provided via your internet service rather than cable specific boxes and wiring needed from the cable company. Better still, they are month-to-month services that let you quit at any time without penalties. And most offer "skinny" packages to help cut down on the cable bill. Sling TV. Perhaps the cheapest way to get live television without a cable provider, Sling TV was one of the first cable-over-internet solutions. PlayStation Vue. Don't let the name fool you. PlayStation Vue is available on a wide variety of devices beyond a PlayStation console. It may also be the best overall cable-over-internet service. DirecTV Now. Yes, the big boys are getting involved. DirecTV Now is a bit of a puzzle. The website tells you very little about it. The interface of the apps is confusing at best. But if it can catch up with its satellite service, it may end up competing with the best of the bunch. The iPad makes a great portable television when you load it up with all of these apps, but what if you want to watch them on your big-screen television? There are a number. of easy ways you can display your iPad's screen onto your HDTV.